In March, we made it easier to view and understand the permissions in your AWS Identity and Access Management (IAM) policies by using IAM policy summaries. Today, we updated policy summaries to help you identify and correct errors in your IAM policies. When you set permissions using IAM policies, for each action you specify, you must match that action to supported resources or conditions. Now, you will see a warning if these policy elements (Actions, Resources, and Conditions) defined in your IAM policy do not match. When working with policies, you may find that although the policy has valid JSON syntax, it does not grant or deny the desired permissions because the Action element does not have an applicable Resource element or Condition element defined in the policy. 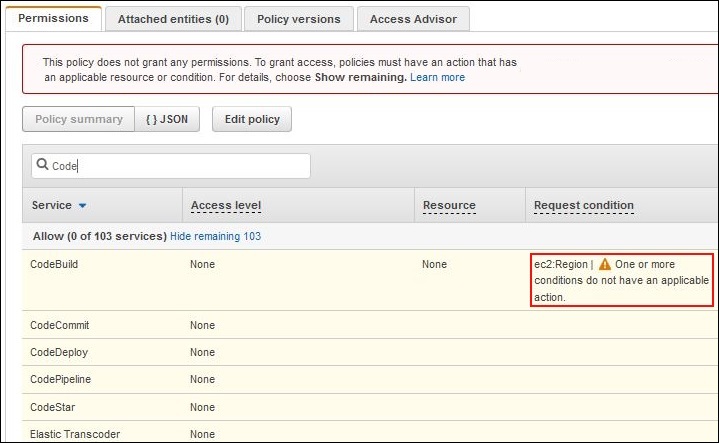 For example, you may want to create a policy that allows users to view a specific Amazon EC2 instance. To do this, you create a policy that specifies ec2:DescribeInstances for the Action element and the Amazon Resource Name (ARN) of the instance for the Resource element. When testing this policy, you find AWS denies this access because ec2:DescribeInstances does not support resource-level permissions and requires access to list all instances. Therefore, to grant access to this Action element, you need to specify a wildcard (*) in the Resource element of your policy for this Action element in order for the policy to function correctly. An action that does not support the resource specified in a policy. An action that does not support the condition specified in a policy. In this blog post, I walk through two examples of how you can use policy summaries to help identify and correct these types of errors in your IAM policies. Let’s say a human resources (HR) representative, Casey, needs access to the personnel files stored in HR’s Amazon S3 bucket. To do this, I create the following policy to grant all actions that begin with s3:List. In addition, I grant access to s3:GetObject in the Action element of the policy. To ensure that Casey has access only to a specific bucket and not others, I specify the bucket ARN in the Resource element of the policy. Note: This policy does not grant the desired permissions. This policy does not work. Do not copy. After I create the policy, HRBucketPermissions, I select this policy from the Policies page to view the policy summary. From here, I check to see if there are any warnings or typos in the policy. I see a warning at the top of the policy detail page because the policy does not grant some permissions specified in the policy, which is caused by a mismatch among the actions, resources, or conditions. To view more details about the warning, I choose Show remaining so that I can understand why the permissions do not appear in the policy summary. As shown in the following screenshot, I see no access to the services that are not granted by the IAM policy in the policy, which is expected. However, next to S3, I see a warning that one or more S3 actions do not have an applicable resource. This action does not support resource-level permissions. This means the action does not support resource-level permissions and requires a wildcard (*) in the Resource element of the policy. This action does not have an applicable resource. This means the action supports resource-level permissions, but not the resource type defined in the policy. In this example, I specified an S3 bucket for an action that supports only an S3 object resource type. From these warnings, I see that s3:ListAllMyBuckets, s3:ListBucketMultipartUploadsPart, s3:ListObjects , and s3:GetObject do not support an S3 bucket resource type, which results in Casey not having access to the S3 bucket. To correct the policy, I choose Edit policy and update the policy with three statements based on the resource that the S3 actions support. Because Casey needs access to view and read all of the objects in the HumanResources bucket, I add a wildcard (*) for the S3 object path in the Resource ARN. After I make these changes, I see the updated policy summary and see that warnings are no longer displayed. In the previous example, I showed how to identify and correct permissions errors that include actions that do not support a specified resource. In the next example, I show how to use policy summaries to identify and correct a policy that includes actions that do not support a specified condition. For this example, let’s assume Bob is a project manager who requires view and read access to all the code builds for his team. 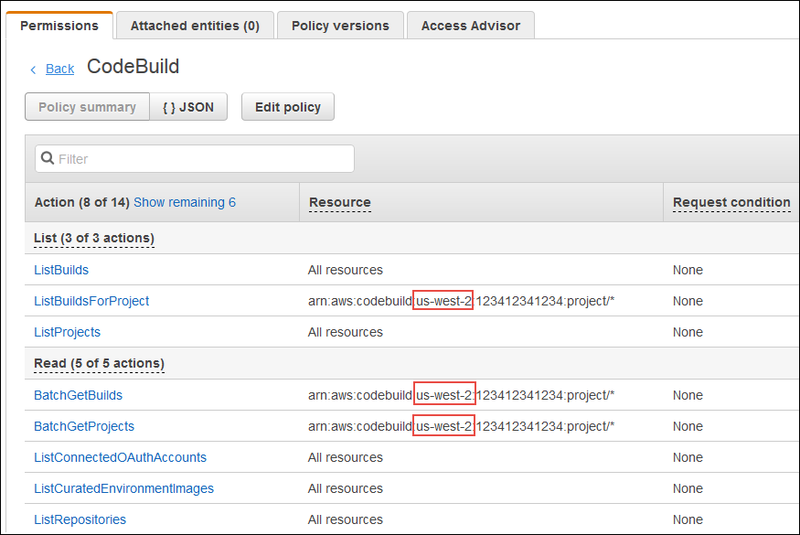 To grant him this access, I create the following JSON policy that specifies all list and read actions to AWS CodeBuild and defines a condition to limit access to resources in the us-west-2 Region in which Bob’s team develops. After I create the policy, PMCodeBuildAccess, I select this policy from the Policies page to view the policy summary in the IAM console. From here, I check to see if the policy has any warnings or typos. I see an error at the top of the policy detail page because the policy does not grant any permissions. To view more details about the error, I choose Show remaining to understand why no permissions result from the policy. I see this warning: One or more conditions do not have an applicable action. This means that the condition is not supported by any of the actions defined in the policy. From the warning message (see preceding screenshot), I realize that ec2:Region is not a supported condition for any actions in CodeBuild. To correct the policy, I separate the list actions that do not support resource-level permissions into a separate Statement element and specify * as the resource. For the remaining CodeBuild actions that support resource-level permissions, I use the ARN to specify the us-west-2 Region in the project resource type. After I make the changes, I view the updated policy summary and see that no warnings are displayed. When I choose CodeBuild from the list of services, I also see that for the actions that support resource-level permissions, the access is limited to the us-west-2 Region. Policy summaries make it easier to view and understand the permissions and resources in your IAM policies by displaying the permissions granted by the policies. As I’ve demonstrated in this post, you can also use policy summaries to help you identify and correct your IAM policies. To understand the types of warnings that policy summaries support, you can visit Troubleshoot IAM Policies. To view policy summaries in your AWS account, sign in to the IAM console and navigate to any policy on the Policies page of the IAM console or the Permissions tab on a user’s page. If you have comments about this post, submit them in the “Comments” section below. If you have questions about or suggestions for this solution, start a new thread on the IAM forum or contact AWS Support.